Here, the best meltable cheeses for a grilled cheese and the sandwiches to make with them. In this week’s episode of Mad Genius Tips, F&W’s Justin Chapple demonstrates how to make Andrew Zimmern’s gooey, stuffed grilled cheese pockets. Chapple uses good, old-fashioned American cheese in the video, but there are plenty of other, more complexly flavored cheeses that are equally delicious between two pieces of butter-fried bread. Here, the best meltable cheeses for a grilled cheese and the sandwiches to make with them. This indulgent sandwich from chef Vivian Howard combines pungent Époisses, a French cow’s-milk cheese, with sweet and spicy pepper jelly. Cheese curds are small chunks of just-made cheese that haven’t been pressed into a shape. They’re milky and delicious in a grilled cheese like this one, which is spread with a savory mayonnaise and topped with bacon. Richly flavored, ultra-melty Gruyère is delicious with both salty and sweet flavors. Try it with ham and strawberry–red wine jam in this recipe. Smooth and nutty fontina is a great grown-up cheese for sandwiches. It’s especially great with sage-accented sautéed mushrooms in these sandwiches. 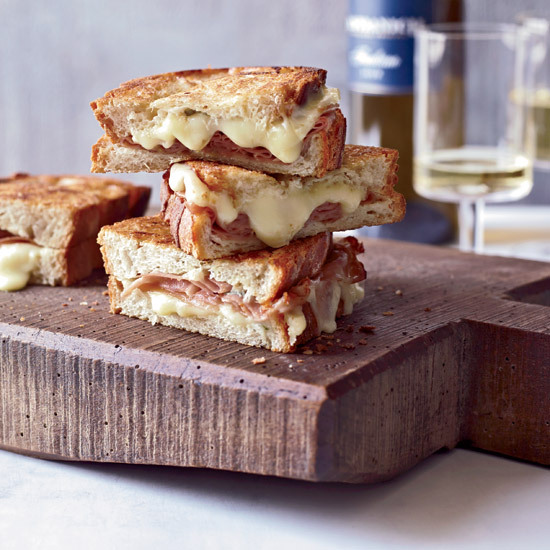 Mario Batali likes to use this soft, mild cow’s-milk cheese in his hearty mortadella and cheese panini. A young semi-soft Mahon is perfect for grilled cheese sandwiches. The mildly tangy flavor is particularly good with briny olive tapenade and thinly sliced lomo ham. Try the combo in this great sandwich. According to cheese expert Laura Werlin, after you bite into a grilled cheese, “the cheese should stretch out past your face as far as your arm will reach.” Classic, extra-sharp orange cheddar is perfect for that. Try it with andouille sausage and crunchy cornichons in this recipe.